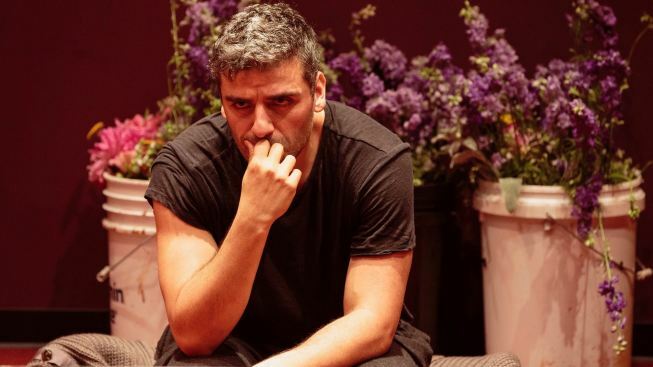 Brooding Prince: Oscar Isaac, above, in Hamlet at The Public. 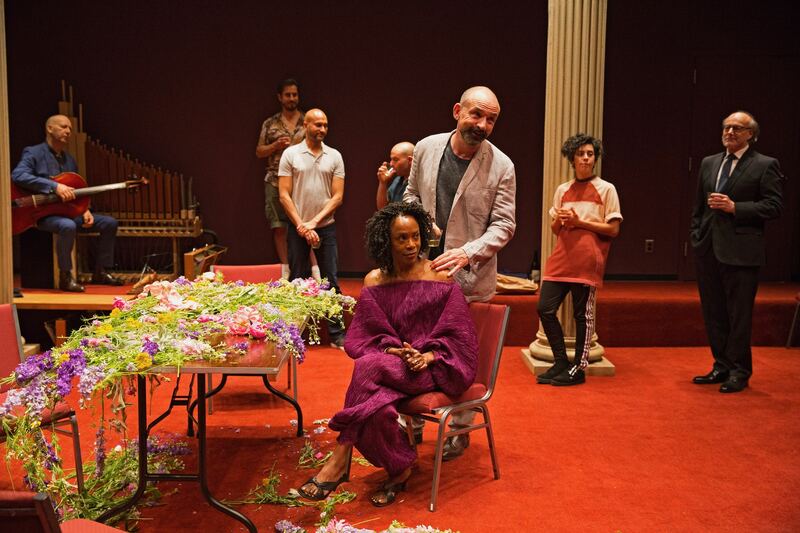 Below, Charlayne Woodard and Ritchie Coster, foreground, as Gertrude and Claudius. Keegan-Michael Key, of Key and Peele fame, is Horatio, behind the banquet table. Oscar Isaac, the rising Hollywood star and veteran of two Shakespeare in the Park productions, is a tireless prince in an untraditional “Hamlet,” now at The Public Theater. This is a sometimes confusing, endlessly interesting staging that is full of color and scent—when it’s not holding our gaze, it is insinuating itself right into our noses. Directed by Sam Gold (“Fun Home”) and staged in The Public’s unassuming Anspacher Theater, this “Hamlet,” like the Danish prince himself, has traveled a tortured road: It’s landed with Oskar Eustis, The Public’s artistic director, after a conflict between Gold and the head of the Brooklyn nonprofit where it was first slated to run. Seating is on three sides of the Anspacher, an unorthodox venue interrupted by two white columns rising up on either side of the playing area. Most of the audience is on risers. For much of this “Hamlet,” which is performed in modern dress, the only props on “stage” are a banquet table and some sterile chairs, atop red industrial carpet. By sight alone, it gives the impression we’re in a rehearsal room, rather than a performance space. Indeed, it feels very much like a natural extension of Gold’s last major New York work, the stripped-down “Glass Menagerie” that inspired some strong feelings last season on Broadway. With “Hamlet,” the vivid and fully inhabited performances—especially from Isaac (“Star Wars: The Force Awakens,” etc. )—make for a stellar distraction from the challenging matters of staging. So, first, about Mr. Isaac. There’s rarely a moment when the wry and charismatic actor doesn’t seem off-balance, consumed as he is by anger that his uncle (Ritchie Coster) has assumed the throne left vacant by his murdered father, and then gone and married his mother (Charlayne Woodard, playing Gertrude with laissez-faire nonchalance). Is there any better way to telegraph to your mom and nasty uncle that you’ve gone nuts than by walking around in your underwear? Nine actors makes for a small cast for “Hamlet,” and the characters change roles with dizzying frequency. I assume Gold is relying on familiarity with the story, but it can be hard to discern when Reynaldo (a deadpan Roberta Colindrez) transforms into Rosencrantz, and so forth. Set designer David Zinn (“The Humans”) has turned a space behind a door at the rear of the theater into a tiled bathroom. Broadway veteran Peter Friedman (“Ragtime”), a marvelous Polonius, will converse with Reynaldo about delivering money and notes on his behalf … while seated on a toilet, with his pants around his ankles, in full view of us. Later, Hamlet will lock himself in the space and emerge with his head poking through a sanitary toilet cover. Flowers of all kinds provide the shock of color in the room. They’re present first for the burial rites of Hamlet’s slain father, who is shortly to appear as a ghost to several of the players—notably, Keegan-Michael Key, of Key and Peele fame, in his New York stage debut, as Horatio. Key gets a hysterical, drawn-out death scene as one of the actors in “The Murder of Gonzago,” the play performed for Claudius that in the story is intended to give Hamlet some clue as to whether his uncle did in fact kill his father. But Coster’s Claudius is offstage for the scene, which denies us a chance to see the character’s reaction. In the play’s final third, Friedman’s Polonius and Gayle Rankin, as Ophelia, engage in a near vaudevillian patter that occurs after both characters have ostensibly died. Somehow, they turn into gravediggers, but Gold leaves matters of their identity rather vague. Ophelia covers her father’s corpse in flowers and, then, soil, which she removes from planters dragged onstage from the theater lobby. Then, she drags a garden hose from that bathroom and waters the whole pile. Dad wakes up, and the theater smells like a moist, dirty greenhouse. Oh, and poor Yorick? His skull becomes a prop fetus that Ophelia hides under her shirt, then “births” in a fit of hysteria shared with her dead, but quite lively father. Kidding aside: I enjoyed Rankin’s Ophelia, who copes with stress by ravenously consuming lasagna from an enormous tin tray—this results in more smells filling the Anspacher. The lasagna later enjoys an encore, as it’s stabbed in rage by Hamlet, who sends specks of it flying at audience members in the front rows. Viewed as a vehicle for memorable performances, this is an awesome “Hamlet”—just note, it’s not a remotely “classic” one. “Hamlet,” through Sept. 3 at The Public Theater, 425 Lafayette St. Tickets start at $115. Call 212-967-7555.